The GamerLympics has events that test your creativity, your ingenuity, and your knowledge. Now it's time to show off your gaming skills. Test your might against the rest of the Escapist community with today's game hosted by Kongregate: ZunderFury. Receive the most mob kills in ZunderFury. Medals will be given to 1st, 2nd and 3rd places and given out on Wednesday, August 13th. You must be a member of The Escapist to participate. If you aren't already, please sign up HERE. THIS LINK. Once at Kongregate go to the top of the page and click on the "Register" button to create an account. Closing this page prior making an account will create an invalid account. Please reclick our link and register. 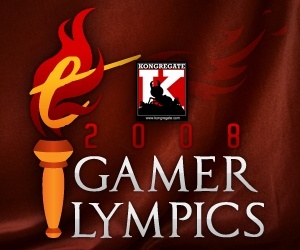 Even if you already have a Kongregate username, YOU MUST MAKE A NEW ONE for the GamerLympics. PLEASE NOTE: Failure to create your account using our link will result in this event being null and void for you. That means you can't get any goodies. Also, failure to update your Escapist profile with your Kongregate username will make you inactive. To start playing ZunderFury CLICK HERE Please remember to be logged in to your Kongregate account when playing.